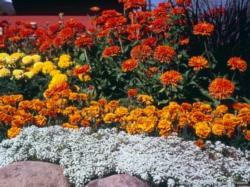 Graceful flowers in a wide range of colors add beauty to a yard. 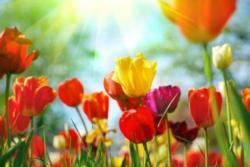 Annuals that do well in Lassen County, after the risk of frost, are pansies, dahlias, petunias, zinnias, delphinium, cosmos, marigolds, sunflowers, alyssum, snapdragons, and California poppies. Perennials are easy to grow and come back year after year. Consider planting sedum, hosta, echinacea (purple cone flowers), day lilies, gaura, scabiosa, spiderwort, solidago, creeping phlox, peonies, dianthus, forget-me-nots, columbines, Shasta daisies, and black-eyed Susans. Iris are hardy and need only a minimum of care. Catnip, catmint, various spearmints, sage, Russian sage, salvia, bugleweed, gayfeathers, and yarrow also do well. Herbs, such as chives, thyme, and lavendar serve a dual purpose. Of course, roses are the queens of any garden. Bulbs planted in the fall make a spectacular spring show. Plant the bulbs three times their height in depth which is usually about 6 inches deep. Crocus are generally the first to bloom in the spring, and then daffodils and tulips. Deer love the taste of flowers like tulips and petunias and roses, so how do I get rid of an annoying deer (squirrel, skunk, ground hog, gopher, etc.)? Pest Notes have some good suggestions for dealing with these garden pests. Deer resistent plants include astilbe, bleeding heart, catmint, coneflower, coreopis, dianthus, euphorbia, blue fescue, iris, Jacob's ladder, lamium, penstemon, phlox, salvia, snow-in-summer, yarrow, and some sedums.